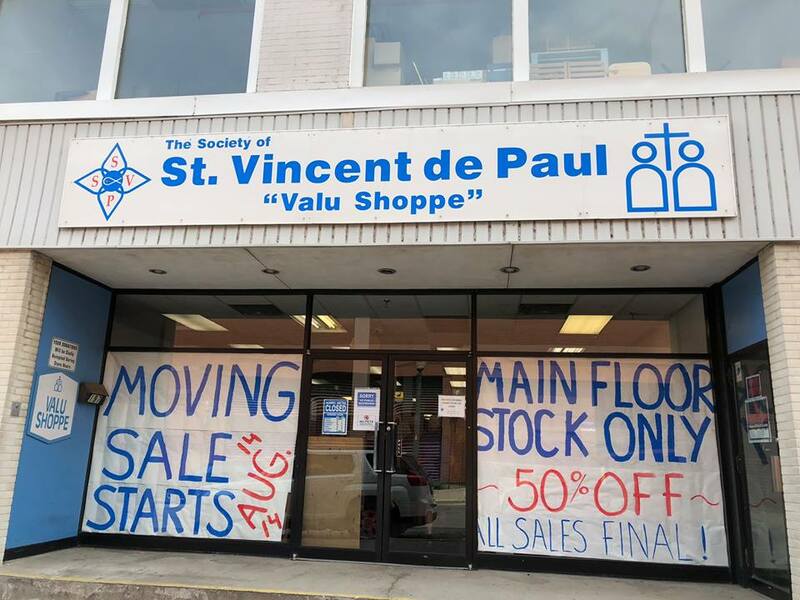 The Society of Saint Vincent de Paul, Brant (SSVP Brant) has never been more excited about having a Sale. Everything on the first floor is on sale for 50% off. However, this is no ordinary sale. This is a moving sale. SSVP Brant is moving its Thrift Store into the former Crosby Cable YMCA building at 143 Wellington Street, (at Clarence) Brantford when the YMCA of Hamilton Burlington Brantford moves into their new Laurier Brantford YMCA building in downtown Brantford in September 2018. Since October 2015, the Society of Saint Vincent de Paul, Brant had been on a mission to find a new home. The Thrift Store had outgrown its space at 197 Colborne so that building was sold. Given the requirement to remain accessible to those that they serve in the downtown core, SSVP Brant faced a challenge: find suitable space in the downtown area to serve the growing numbers of their neighbours in need and do it before they were required to vacate their former building. Call it luck or divine intervention for both organizations when the Y and the Vincentians agreed on the sale and purchase of the Crosby Cable building at 143 Wellington Street. The Society of Saint Vincent de Paul, Brant needed a building and the Y needed to get out of their building. It was a good fit for both parties. Now almost three years later the dream for both organizations is becoming a reality. The Society of Saint Vincent de Paul Brant is undertaking renovations at the Crosby Y building while the Y is still serving their members at that location until moving into their new facility later in September. In early October 2018 the Society of Saint Vincent de Paul, Brant will have a ‘soft opening’ of its new Thrift Store. Details will be available on the Society’s website www.ssvpbrant.ca and its Facebook page https://www.facebook.com/SSVPBrant/. Contact: Mrs. Pat Lenz, President Society of Saint Vincent de Paul, Brant at ssvpbrant@gmail.com . Next Next post: FINALLY – The opening of our new Thrift Store!